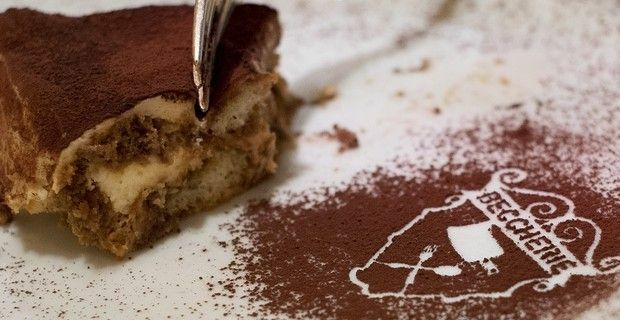 An important piece of food history is about to disappear as the restaurant credited for inventing the world famous Tiramisu - "Le Beccherie" in Treviso, Italy - will soon be closing its doors after 75 years of trading. The Tiramisu ('pick me up' in Italian) is the delicious and sinful dessert made with Savoiardi biscuits dipped in coffee, and layered with a whipped concotion of egg yolks, egg whites, sugar and mascarpone cheese and covered with cocoa powder, that was invented by owners Alba and Aldo Campeol, and pastry chef Roberto Linguanotto. It is generally recognized – at least in Italy - that they adapted the recipe from the ‘pick me up’ desserts that were being used by prostitutes in bordellos, who needed a ‘pick me up’ between customers. Restaurant owner, 60-year old Carlo Campeol said that he is closing the restaurant due to the economic crisis that has hit hard, even the productive and rich north-east area of Italy. The Beccherie is known for its traditional Veneto food, like their boiled meats, the ‘sopa coada’ (pigeon soup), ‘pasta e fasioi’ (pasta and bean soup), red radicchio, bruscandoli (tips of hop plants to make risotto) and zaeti( yellow cookies). Many believe is the real cause of the restaurant’s downfall is that the owners have been unable to modernize and reach out at Italians are looking for cheaper ways to eat out, and seem no longer interested in the quality of food or in culinary traditions. A highly disappointed Campeol said, “I’m closing March 30, that day I’ll pay my three employees and my suppliers and closing down the restaurant forever." He also added that he no longer young enough to continue fighting to keep his famous restaurant alive after three generations – it opened in 1939. “This is the end, not just of a piece of Treviso’s history, but also marks the closing of a page in the gastronomic culture of the world,” he said. “Le Beccherie is where tiramisu was born,” said Luca Zaia, president of the Veneto region, where the city of Treviso is located. Zaia campaigned last year to receive European Union certification (just like pizza) that the tiramisu is a typical Treviso dish, and fight against the imitations and adulterations that have cropped up in other countries.